The company Inflight Enterprises provides energy to businesses. 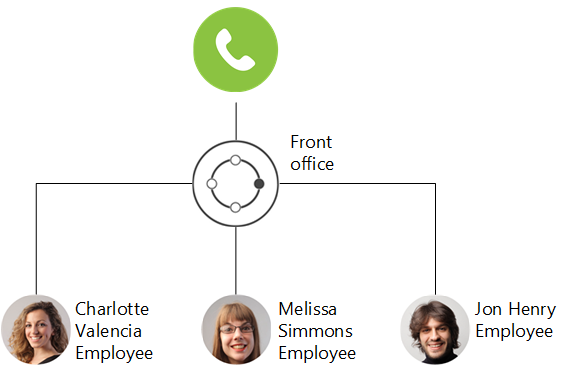 Every new customer is assigned a single point of contact (SPOCSingle point of contact. A situation where a caller is preferably transferred to the same Agent.). A customer’s SPOC can be reached via the central telephone number or the SPOCs direct access number in case they have questions regarding provided services or received invoices. The last few years the amount of emails and voice mails containing callbackWith CallBack the customer can leave his / her number to be called back by an available agent during business hours. requests significantly increased. To reduce the amount of these messages Inflight Enterprises decided to implement the Anywhere365 Unified Contact Center on its existing LyncMicrosoft Lync (formerly Microsoft Office Communicator) is an instant messaging program designed for business use and is the successor of Windows Messenger. In order to use Lync, a Microsoft Lync Server is required. and Skype for BusinessSkype for Business (formerly Microsoft Office Communicator and Microsoft Lync) is an instant-messaging client used by Anywhere365. In order to use SFB, a Microsoft Skype for Business Server is required. Skype for Business is enterprise software; compared to Skype, it has different features that target businesses. environment. Currently, the front office consists of four employees with a SPOC role, their number might increase fast in the near future. One of Naomi Browns customers calls her via the company’s central phone number. The customer's number is recognized and the call is forwarded to Naomi first. In case Naomi is not available, the customer will be forwarded to an available front office employee. If customers have to wait too long, they have the possibility to leave a voicemail. Once the customer leaves a voicemail, the front office will be notified by email or SMS in order to take action. 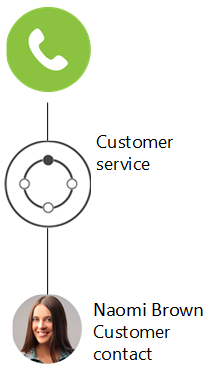 As you can see the customer now has access to a hybrid SPOC that will not only answer the call when available and follow-up on voice mails when not. The SPOC in this case is also backed up by a complete group of front office employees that will answer the call directly when the caller does not want to leave a voicemail. The customer remains in control as he/she can judge the sense of urgency best. As an added bonus of this strategy the amount of voice mails will be reduced significantly. Below a step-by-step guide can be found to configure a UCCUCC stands for Unified Contact Center and consists of a queue that can be handled by Agents Each Contact Center has its own settings, interactive voice response questions and Agent with specific skills. Agents can be member of, or sign up to, one or more Contact Centers. for this scenario. 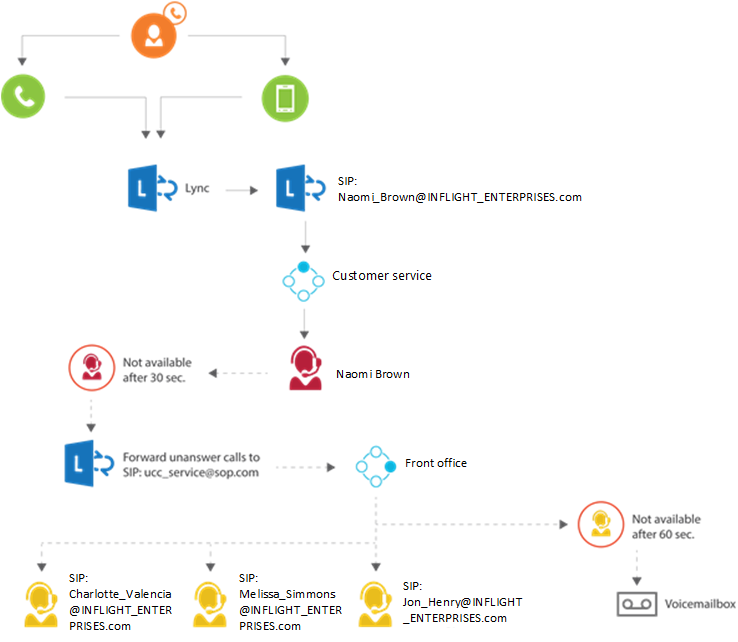 InterceptorThe Interceptor is a service installed on the Lync / Skype for Business Front End(s). It monitors all the calls going over it. When a call going to or coming from an Agent it will come in to action. By intercepting that call and redirecting it you the Anywhere365, it lets you manage the Direct Inbound and Outbound dialogues of the Agents. installed and configured, with at least Inbound. First, the Skill “Service” should be added. Add the Skill "Service" to "Welcome Message"
(Optional) Remove "Question 0-1, 0-2 and 0-3"
Add Choice 1 to "Message Busy"
Set Voicemail to True on "Message Busy"
Tip By setting a Choice and a Voicemail on the Message Busy, Callers have the option to leave a voicemail if they are in the queue for more than 60 seconds. Next we need to add a setting to the UCC. Add the setting "DisableCallForwarding" with value "True" to the Settings list. Tip This will disable the Skype for Business Forwarding settings of the Managers when the Call enters the UCC, but will still enable the Skype for Business Forwarding settings for a Direct Call. Lastly the Agents needs to setup their Skype for Business clients. Forward unanswered calls to "SIP:ucc_service@INFLIGHT_ENTERPRISES.com"
If the Agent is available he/she will receive the Call directly, if he/she isn't available the calls will fallback to the UCC.